My dad is a sucker for all things lemon. 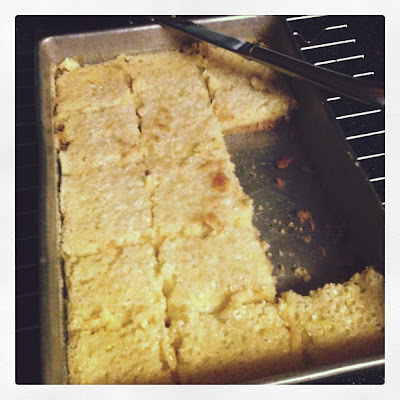 The other night he pulled out a Company's Coming "Most Loved Treats" cookbook, turned to lemon bars and let me know I should make them, if I had the time. The crust called for 2 sticks of butter, so I got to googling, trying to find some waist-friendly alternatives. In a large, microwave safe bowl, melt the butter. Add the flour, sugar, salt, and vanilla, stirring until well-mixed. Spread out into a 7" x 11" pan. Bake at 350° for 20-25 minutes, until browned. Remove and let cool while you make the filling. Whisk the eggs until frothy. Add the sugar, flour, baking powder, and peel if using, mixing until incorporated. Stir in the lemon juice. Pour into the cooled crust. Bake for ~20 minutes, or until set. Remove from oven and let cool to room temperature. Sprinkle the top with confectioner's sugar if desired. Cut into bars and enjoy!! Looks good Christina! I've actually reduced butter making just regular chocolate chip cookies, use 1 instead of 2 and I think they still turn out great. Glad you found a slimmer version crust! I love lemon bars! I always make the Krusteaz brand (because I'm lazy and not much of a baker) but I like what you did to make these healthier. I will be trying this recipe! Hi Christina. OOOH...these look so good. Dennis is a big lemon fan too, I'll have to make these for him sometime. Have a great Monday.